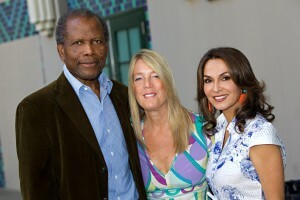 The highlight of the series of book events I had this week was being introduced by Oscar winning actor, Sidney Poitier, at the Beverly Hills Public Library. What I have always admired in him was that early in his career he took pride in portraying his community in a way that brought a sense of dignity and pride and shaped a new vocabulary for generations to come. He is a true trail blazer to me. He was gracious as always and shared the kindest words about my book and poetry. I was touched by the fact that he viewed me as “the quintessential example of a gobal citizen”. There is no higher compliment given by such an esteemed human being. I hope I live up to it. Certainly the message of Life as a Visitor is just this: we are all different, yet we have so much in common, and bonds with others are forged when we connect on our deepest and most genuine level.